vSAN reduces the total cost of ownership by up to 50% by eliminating traditional hardware storage costs with intelligent software-defined storage that accelerates the shift to server economics, affordable flash, and the broadest selection of x86 platforms for HCI. Join this webinar to discover how VMware vSAN can work for your business needs as we share a few case studies of businesses who have already deployed. 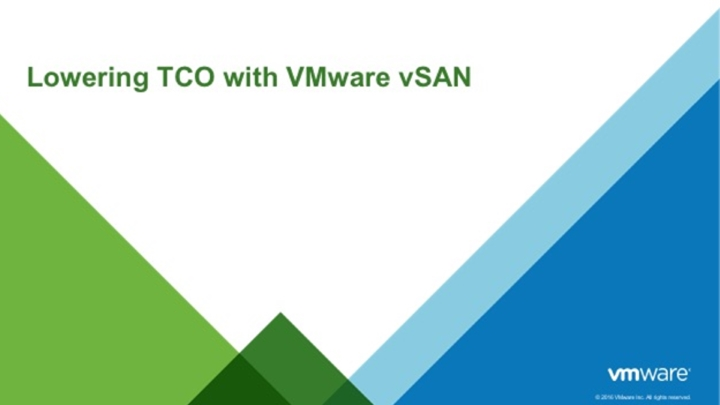 Make sure to see all the episodes on this 3-part webinar series, where we will show you how VMware vSAN accommodates non-virtualized workloads with iSCSI support, eliminates the need for routers and switches in 2-node ROBO deployments, and how to save on storage costs through server side economics and greater space efficiency. We’ll also describe how a single SPBM framework delivers consistent performance and protection in mixed vSAN and VVOL environments.